Enjoy up to 2.5% Cash Back on all purchases. Additional 1% Cash Back for HSBC Advance banking customers. 1-year annual fee waiver (Perpetually waived for HSBC Advance banking customers). Enjoy flexible monthly payment and no processing fee with HSBC’s Card Balance Conversion Plan. Apply today and receive a free Samsonite Astra 55cm Luggage (worth S$350) and $20 worth of Grab Rides. 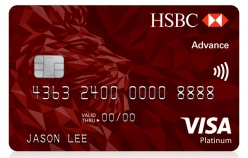 The HSBC Advance Platinum card is a credit card that allows you to earn cash back as you spend, offering up to 3.5% rebate on all purchases, with no minimum spend requirements. However, if you spend below S$2,000 a month you only receive 1.5% cash back. Furthermore, HSBC Advance Banking customer enjoy a permanent waiver of annual card fees, for as long as you hold the card. 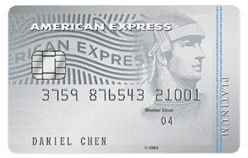 Key features of the card include earning reward points at an accelerated rate with 10X rewards points and exclusive lifestyle privileges. Up to 16% instant discounts at all Caltex, with up to a further 5% cash rebate. Up to 14% instant discounts at all Shell stations, with up to a further 6% cash rebate. Movie tickets at Golden village will cost from $7 onwards with HSBC Movie Card. Exclusive low rates of 0.8% p.a. for 6 months on HSBC’s Card Balance Transfer. HSBC Advance card comes standard with ApplyPay, an easy way to make payments in stores, in apps and on the web with your iPhone, Apple Watch, iPad and Mac. You can securely make payments and continue to enjoy the same rewards and privileges as you will with your physical HSBC Credit and Debit Card. If you’re not already an HSBC advance account holder, then you’ll need to apply to get the additional 1% cash back. To qualify for an HSBC Advance account you must be over 18 years old and pay a service charge of S$10 a month unless you meet the below criteria. Total relationship balance of at least S$30,000 in deposits, investments and/or insurance, with 6 months’ grace period to place in your funds. Home Loan with an initial loan quantum of at least S$200,000. Salary crediting or recurring deposit of at least S$3,500 per month and have applied for / hold an HSBC Credit card or Personal Loan. Recurring deposit of at least S$2,500 per month, with 24 months grace period from Advance relationship opening to reach total relationship balance of at least S$30,000. HSBC Advance is an exclusive program designed to offer customers a variety of special offers, including priority queues, exclusive rates and reward offers. You can manage up to 11 different currencies including SGD anytime, anywhere with a Multi-Currency Savings Account. Plus enjoy preferential pricing for personal loans, mortgage and line of credit based on your total HSBC relationship. How do I apply for an HSBC Advance account? Apply for the HSBC Advance account is easy, you simply visit any HSBC Branch or complete the contact us form and an HSBC staff member will contact you for account opening assistance. 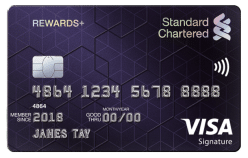 Overall, the HSBC Advance Visa Platinum card is a great card for earning cash back and promotional rewards that give you the flexibility to earn whatever you fancy. 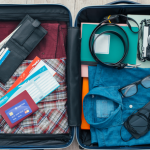 With its attractive fringe benefits in travel, entertainment and with instant petrol discounts, it makes for a great card for HSBC Advance customer and any cardholder looking to earn 2.5% cash back. Are all purchases eligible for cash back? Cash advance i.e. when you take cash from an ATM. Balance transfers i.e. when you transfer a balance to your credit card, don’t expect a cash back. Tax payments via HSBC tax payment facility. Transactions made on brokerage/securities and on money payment/transfer websites. Transactions relating to money orders, traveller’s checks, gaming. Any transaction via an AXS or ATM transactions. 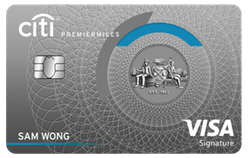 Pre-paid card top-ups including but not limited to EZ-Link, Transitlink or NETS Flashpay. Any other transaction determined by HSBC from time to time. What credit limit can I expect to enjoy? The amount of credit offered different for each cardholder and based on your personal circumstances. The credit limit will be subject to the Bank’s review and approval process and may be lower than the amount you have requested. Please note that for individuals with annual income between S$30,000 and S$120,000, your aggregate credit limit with HSBC for all unsecured facilities will be capped at four times your monthly income as indicated in the income documents that you submit. Still not sure which HSBC credit card to get? Then why not compare all the best HSBC credit cards here at EnjoyCompare. All applicants must be an existing HSBC Advance account holder. For Singaporeans and Permanent Residents, a minimum annual income of S$30,000 is required. For self-employed and foreigners, a minimum annual income of S$40,000 is required. If you do not meet the above income requirements, a minimum Fixed Deposit Collateral of S$10,000 is required.